Consider an n-vertex planar graph G. The depth of an embedding Γ of G is the maximum distance of its internal faces from the external one. Several researchers pointed out that the quality of a planar embedding can be measured in terms of its depth. We present an O(n 4)-time algorithm for computing an embedding of G with minimum depth. This bound improves on the best previous bound by an O(nlog n) factor. As a side effect, our algorithm improves the bounds of several algorithms that require the computation of a minimum-depth embedding. A shorter version of this work appears in Proceedings of the 10th Workshop on Algorithms and Data Structures (WADS 2007), vol. 4619 of LNCS, pp. 287–299. 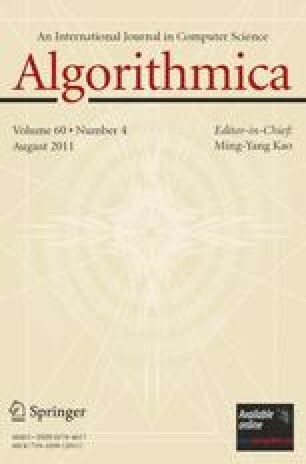 Springer, 2007, under the title “Computing a Minimum-Depth Planar Graph Embedding in O(n 4) Time”. Work partially supported by EC–Fet Project DELIS–Contract no 001907 and by MUR under Project “MAINSTREAM: Algoritmi per strutture informative di grandi dimensioni e data streams”.